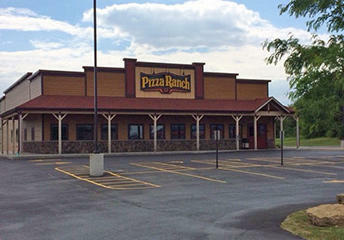 Pizza Ranch in Lake Delton, WI | 1131 East Frontage Rd. Add a soft drink for $1.89. All prices listed are before tax and subject to change without notice. 3pm-9pmFreeOne child 10 & under per paying adult. Lunch: $7.99Dinner/Weekend: $9.25Must be 60 years or older. Cannot be combined with other offers. 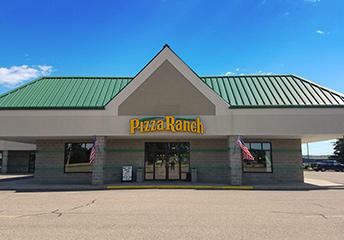 Bring your appetite to the Pizza Ranch in Lake Delton, just a five-minute drive from all your favorite Wisconsin Dells attractions. Get a taste of the Old West and our legendary buffet—featuring our most-loved pizzas, the Country’s Best Chicken®, and fresh fixin’s. If you don’t see the pizza you want, let us know. We’ll make one fresh and bring you the first slice! 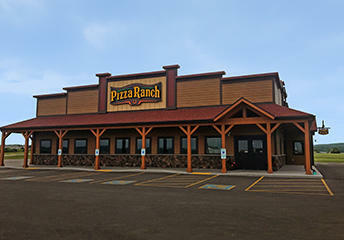 While visiting Wisconsin Dells, stop by Pizza Ranch for a legendary experience the entire family will enjoy. We’re conveniently located on the same entrance road to the Kalahari Resort, the AMC Desert Star Movie Theater, and near the “Outlets at the Dells” outlet mall. After a day of adventures, refuel at the Ranch. Bring the kids or a crew—our community rooms combine to seat up to 72 and are perfect for group events. And if you don’t feel like going out, we’ll take care of that, too—just order online or call in, and we’ll deliver. The person at the counter did not tell us that they do not do half and half as a special along with the buffet. So she charged us full price and then she came back and said we had to pay for the buffet and a salad, we did pay for one soda when we paid for the pizza. I do not feel that we should have not had to pay for their mistake. When told her we wanted the buffet and order the special pizza. I will not be visiting the place to much more. And I have already told some of our friends. They feel the same way we feeel. We love pizza ranch!! The food is always good and the staff there is very nice!!! Order made wrong even called 20 minutes ahead of time to ensure it went through and correct was insured all was good. Then I get a buffalo chicken pizza with no buffalo sauce. My pizza was just meat and cheese no sauce at all. I would have rated 5 stars as the food was great, restaurant was clean, but we kind of were put off by how, even though the door said they closed at 10 pm, they seemed to be trying to close early. While we were eating, a couple came in at 9:10 and were turned away. There was tons of food out. Also, the manager came over and asked if we were done eating because they were going to shut down the pizza buffet. He told employees they could grab something if they wanted, which was better than throwing it all away, but they had just turned paying customers away. Maybe closing at 10 means “the place is all cleaned and our employees are home in bed by 10,” not “the dining room is open until 10.” Just confused. Hello Diane. Our Buffet Hours are 11am-9pm on that date. The store still takes Carry out Delivery and Dine in (from the menu only) orders from 9 pm to 10 pm. I hope this clears up any confusion. We hope to serve you again soon! Always enjoy my dining experience at this location. The food was excellent. Really enjoyed it. Very Friendly ranch hands and extremely helpful. We mostly pick up at the drive up and our food order is always correct and food is hot. We use the points and get money off our food and coupons. Great place, good pizza and chicken.